Trade paperback size collection of short stories by Kevin Siembieda and a host of known Palladium writers. Each story shows what it's like to live in the shadowy no-man's-land of the Chi-Town 'Burbs. A collection of hopeful people waiting for admission into one of the fortified city havens of the Coalition States, and the people who prey upon them. The Chi-Town 'Burbs are the most famous of these tent cities that officially don't exist, and therefore have no formal government or laws. Refugees, D-Bees, fugitives, and outlaws of every stripe make their home in the 'Burbs, or visit to sell their wares or get a little R&R. 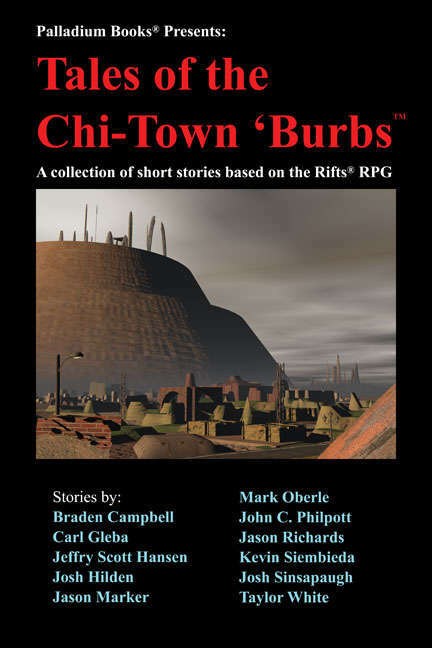 These are just some the stories that provide adventure and insight into the world of Rifts®. Trade paperback size (6 x 9 inches). Stories by Kevin Siembieda, Jason Marker, Braden Campbell, Carl Gleba, Jeffry Scott Hansen, Josh Sinsapaugh, Taylor White and other fan favorite, Palladium authors. 224 pages - Cat. No. 304. This title was added to our catalog on July 06, 2017.